Hey Jared thanks for sharing all your setups i noticed on some of your setups that you don’t have the side pods screws marked does this usually mean your not running them? or do you run them all the time and don’t play around with taking them out. What’s your thoughts on running the front caster blocks on sc6 like the rt6 in the wide position to make the front more stable? Thanks for all the info i was wondering what your thoughts were on going from wider rear pivots to narrow ones that you have been running lately? have you found that running narrower making your cars freer on the higher bite tracks? For me it’s a comfort thing when I get on the throttle. Once I get it where I feel it is right for me, I don’t really change it track to track. It’s not really looser or more hooked up, it’s the way the car exits the turn on throttle. I would try my Nationals setup with just softer springs front and rear. Jared I noticed you went back to the ball diffs for the nats. Any reason why? Thanks Jared for posting the setup sheets! I have one question, on the truggy how many spacers do you run on the rear hub? 2mm/3mm or 3mm/2mm? Hey Jared i was looking at some setups for the ZX6 and was wondering are you running the kit rear axles with the 2mm spacer or have you gone to the 2 line axle and omitting the spacer? i saw a setup with the 65.5 axles and wondered if you have done this? I use the kit 62.5. I have a thick and 2 thin on the inside, and just a think on the outside. Hi Jared, thinking of making the switch to KCar for 2wd and 4wd. Whats a good setup to start with for Mid mount on RB6 on medium to low grip tracks. any upgrades needed from box setup? I would start with my Surf City setup. I am actually working on a new setup that I think will suite well for low traction tracks also. Common upgrade parts and the only upgrade parts that I use are the aluminum steering parts (crank arms, and ackerman bar), aluminum rear sus mounts, and aluminum rear hubs. Thats for 2wd. 4wd upgrades would be UM713 (rb6) rear arms, and aluminum rear hubs. Hi, Tebo. Sorry for texting this message for two times. I think my questions should be posted here in the setup section. I just have some questions about the SC6 ride height. How do you set the ride height, I mean with the body or without the body, also includes the ZX-6. Without the body, I can not set the front end into 30mm and the rear for 28mm, even though I screw up the collar to the top. I am using the stock pistons, springs and 32.5wt for front and 27.5wt for rear, because of the cold weather in my hometown. If I screw up the collar too much, springs just dropped off from the bottom cups very frequently, because the length between the collar and bottom cup is longer than the spring, for both front and rear. I do not how to resolve this issue. I have tried a lot of different X-gear springs and reassembled the shocks for many times to change pistons and oils to get the 30mm in the front and 28mm for rear, but I did not success. I am just wondering how you work on your SC6. Thanks a lot. Tabo. I set my ride height with the body off. Yes on the front shock of the SC6, the spring will be a little loose on the shock when the front end is fully extended, but it should not cause any issues on the track. I do not have any special tip for that. Thanks, Tebo. I would have a try red springs in the front end. I recently signed on with Kyosho America and was looking for setup info for my rb6. I have 2 cars (mid-motor & rear motor) I am from the Boston area and the indoor tracks are somewhat heated but still on the cold side. Do you have any suggestions on a good low-bite clay indoor track. Thanks for your time. Hey Scott. Congrats on the Kyosho deal. Im going to be posting my setup from this past weekend JC race. That should be a good starting point. You could swap out the gold rear spring for the white if grip is low. I only use drag brake on 2wd cars, not 4wd. I feel you must use drag brake on 2wd to get the car into thd turns and have it start braking before you use the push brake. 4wd drag brake also brakes the front wheels. I have a hard time hitting jumps accurate when i try drag brake in 4wd. No i dont use dual rate in the steering. Hi Jared i saw you put your shorty sideways this past weekend wondered what your thoughts were on running it this way is it better than your previous layout? I think it works much better. The car has much more grip and the rear end just moves more and works better. I think you need some weight off the side to generate side grip. I havent ran it on high traction yet. Great thanks have you tried using d-in inner rear pivot with your new setups yet? Congrats on all the wins this past weekend are you notching out your side pods to run the batteries sideways in your 2wd/sc? Jared, i was noticing that your Nationals set up had quite a bit of weight added to the truck. Was this for traction or to fight the trucks tendency to nose dive in the MM configuration? I was just trying it, it didn’t seem to work that good. I ran saddle pack in my SC at JC with no extra weight, and my truck was awesome. Hi Jared was wondering will you pissibly ever come over to the east coast to host a seminar or a driving school? IS there an email I can email you questions and race quaestions and more detailed things? or is this the only place to get in touch with you? Jared, Just wondering if its not too much trouble or if the set up is new and more of an advantage than you want to give up right now, but if you could post your set up for the SC6 you used at Hobbyplex. Thanks. Thanks Jared. Have you tried PB Blaster yet? Works the just as good as liquid wrench but doesn’t swell the tires. I havent. Where do you buy it? autozone, oriellys, whatever you guys have back there, should be right by the LW. Hey Jared whats the difference in the new front shock tower for the rb6? i see you jc setup has std 19mm front tower. jared i see you used the lt blue springs on you buggies are they the 70mm or the new 78mm ones? Jared thanks wishing you and your family a happy New Year. Hi Jared, i saw your RT6 and noticed you had brass weights next to the rf front block could you share what company makes these? Hi Jared wanted to ask you…How in the hell do you drive so fasttt and stay clean and consistant at the same time? 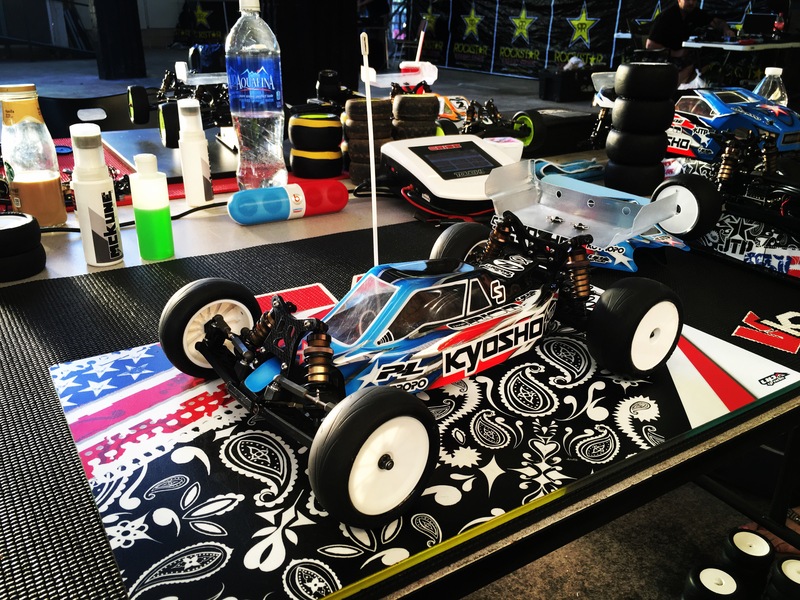 I am only 15 years old, and I run the Kyosho RB6 and recently got an MP9 TKI 3 and I’m very excited to burn some nitro in the summer..back to the point is, I am trying to go pro like you guys and race at big events like the Reedy Race,World (if I can even get there), PNB,Dirt nitro challenge all the big races that are buckt list races for all you guys, and I am trying to get fast and better but everytime I push my self to drive a little faster, I got from driver clean to htting pipes a little and making little mistakes? How can I improve my driving skills to be faster and faster but not be reckless, I admire the way you drive, and how you are as a persone always respecting people always willing to give help, and best of all always the respect the man that determines how your life will end up..Jesus! This is why I admire you and Cody Kannnggg. You are both my favorite drivers in the racing scene! If you could give me any pointers and things to focus on while racing and things to make me as fast as you (obviously ithat will probablly never happen..lol) but just things I can work on. Thank you so much for what your doing and continue to be the Jared Tebo we all know! Congrats on the lastest win in Ohio! I have copied your ZX6 CRCRC setup with UM713 rear arms. I have the rb6 1.4 sway bar and rb6 rear stabilizer mount and also drilled the new inside hole on arm. I’m having issues with the shock and sway bar mount rubbing when all assembled. Its close but remains clear with factory inside hole. Am I using the correct parts? yes you have the correct parts. I bend the sway bar a little more than factory to keep it away from the shock. I will be adding 1/8 setups to my setup page soon. Hey bud, I just got a used KO EX1 from someone and i have reset to factory setting. I was wondering if you had a video of how to setup the radio the correct way. I don’t. sorry. On the EX-1 I run the speed setting on normal. biggest mistake people make is using the Trim to set their servo’s straight and not using sub trim. Also using Duel Rate to turn down the EPA, instead of using Travel. 2015 CRCRC setup for RB6, are you running a spacer above the rear rear suspension hanger and bulkhead as noted on page 23, step 29 of the RB6 manual (A 130 or B131). If so, what thickness? This adjustment states this is for increasing the skid angle. Yeah that adjustment is for anti squat. I run the thin in both spots. You must use either both thin, or one thick on either position. Just reading through your blog……great reading!! Yeah I’m going to work on getting all my 1/8 setups on here after this weekend. I just need to put them all in the program, then I can post them. Basic shock oil with 1.3×8 is 45/32.5 with blue blue springs. Hi Jared, saw ur videos last night club racing at Fastlane Raceway. Can u post ur setups from that track. The 2wd looked great. Jared i have been looking at your 1/10 setups and with your most recent setups on the sheets you don’t show limiting on the rb6 rear shocks have you done away with it or you still running 1mm? Yes my current RB6 setups do not have limiting in the rear shocks. Hi, Tebo. I just have a question on the ZX-6 rear arm stabilizer. I notice most of times, you will use the UM713 RB6 rear arm on your ZX-6. But how do you mount the stabilizer? Do you use the UMW708 link set? And you always use 1.4mm sway bar in the rear, is it come from the UMW708 package that for RB6 using or just the bar for ZX-5 & ZX-6 using? Also you always prefer drill a custom hole for mounting your rear shocks(always 17.5mm from the sway bar hole, center to center), is there some tricks on it? I mean how to do it, why it is 17.5mm? Can you share it with us? Thanks a lot. Yes with the 713 rear arm, you mount the sway bar just like you do on the RB6. Yes I use the 1.4mm sway bar from the RB6 sway bar kit, but I am pretty sure they are the same as the ZX6. I have felt that the new inner hole that I drill works very good in most conditions. I haven’t driven on really high traction yet. 17.5mm is just where I tried, and I thought it worked very good there. It is center to center like you said. To do the hole, you measure, then drill it. Make sure your drill bit is smaller diameter than your screw, and I put the whole right on the seem line of the arm. Make sure you run a pretty long screw in the shock as well, 3x15mm. Thanks a lot for your fast reply, Tebo! Hi, Tebo. I am changing the rear arm for my ZX-6 right now. I plan to use the gear diff on my car during this time of maintenance. Have you tested the gear diffs on different kinds of condition? What is the most common oil number you filled for front and rear? Thanks a lot. The setups you post are really helpful. I am curious about the move to the ball diff from the gear diff @ the Cactus 2015 on your RB6 vs the previous year. Was the indoor track that much different? I’m really interested in your thought process there. Yeah indoor clay and outdoor sugar have a very different feel. I tried a gear diff, but preferred the ball. A gear diff makes you car feel much more sensitive on throttle. The layout and wavy feel of the track didn’t suit it. Hi. 4wd question. Which front hub carrier set do you prefer and why? 7 or 10? And the shims, do you use it up or down on the hub. I normally run the 10 degree and spaced down. It just seems to work best for me that way. Since I have ran it sideways, I haven’t gone back to inline. I feel it works better sideways in all conditions. It transfers weight better that way. Hey Jared, Great site with info, How much did you change your RB6 when running on carpet with Schumi-tires? We run on those tyres indoor all Winter on carpet, would love to hear what you think? The setup sheets only work if you have Adobe. I would make sure your drive train in free, arms are free, diffs are build properly, slipper is set correct. hey jared, just got an rt6 and looking to find a good starting point setup. The track I run on is red clay medium traction and very bumpy. Guys are running super soft slick tires there in stadium truck. Also would you recommend running a shorty battery sideways mid motor like the rb6 since i dont have saddle packs? What about the 3 gear trans? Hi Jared what’s your thoughts on running the 3 gear trans on lower bite tracks?